If you are putting together a list of names in Microsoft Word, usually people will want that list to be in alphabetical order. Rather than doing the alphabet in your head, you can let Word do it for you. The process is pretty simple, but if you aren’t an old Word-veteran then it’s likely that you haven’t used it before. Let’s take a look. 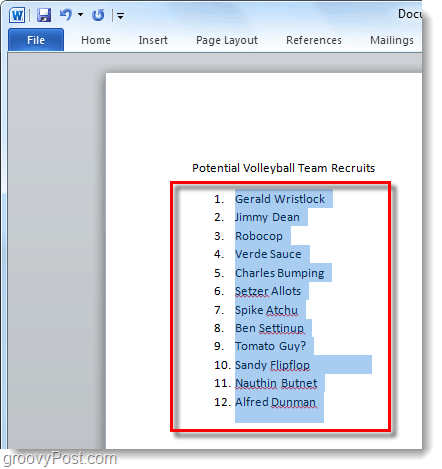 The process is fairly similar no matter what version of Office you are using, but the screenshots below may vary as they were taken using Microsoft Word 2010. This How-To assumes that you’ve already written your list in Microsoft Word. 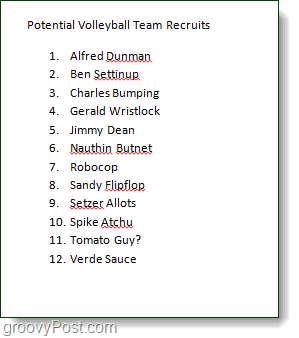 Select your bulleted or numbered list. Under the Home ribbon and the Paragraph tab, Click the Sort button. The sort button looks like the letters AZ with a down arrow next to them. The Sort Text dialog should appear. Under Sort by Select Paragraphs and under Type Select Text. 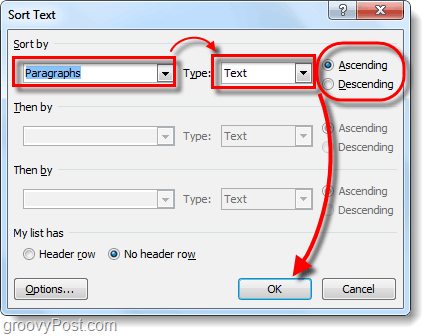 Then choose whether you want Ascending (A to Z) or Descending (Z to A) sorting. Once finished Click OK.
Now your list should be sorted alphabetically! That sure was a lot easier than manually moving them around and typing them in order yourself. Very helpful tip. I had forgotten, but knew there was a way. Thanks! Next to numbering and “find and replace,” sort alphabetically is one of the handiest features of Word. As someone who deals with lots of long, long lists, Word’s features saves me from a lot of tedious weeding out of duplicates. Thanks very helpful.Can you do the same in one note? Thanks a lot Man. So simple a solution which many like me are totally oblivious of. Was of great help. This is great and it sorted it by first name alphabetically but how do I get it to change and sort the last name alphabetically? Very helpful: simple and straightforward – Thanks! In Word 2010, I have a list of email addresses. Followed your instructions (pretty easy!–select all, click a to z button, select paragraph and text, and click okay). Nothing happens! I notice there are degree signs before each email address when reveal codes is activated. thanks for the info. i struggled for ages, yet, when i did what you instructed, hey presto! !